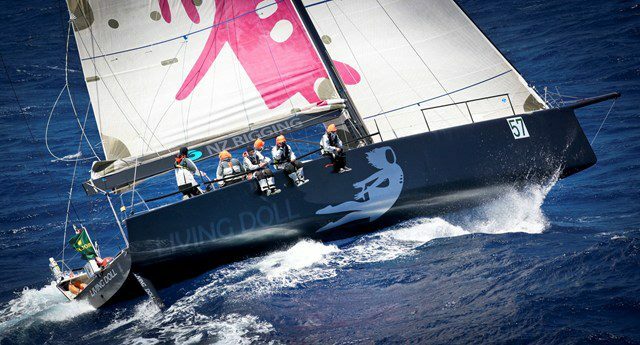 LIVING DOLL is a 55 foot IRC racing design. With a large presence of TP52’s optimized for competing in many IRC fleets, our goal was to design a boat that could race in the same class; faster with a relatively better handicap. 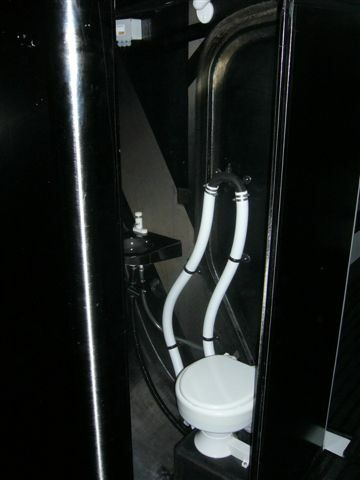 The 55 foot length produces the desired performance leap and moderate increases in displacement, draft and sail area limit the increase in handicap. The hull was developed using the knowledge gained from our recent extensive CFD research on Volvo 70s and GP42s. A unique feature with a large impact on the hull design is the twin rudder steering arrangement. The twin rudders generate much less stern up force allowing the bow to be finer forward for less drag in waves and chop. Because the stern lifts less at high speeds the effective sailing length can be maximized over more of the speed range without incurring handling problems in extreme conditions. Ease of handling in reaching and running conditions was a prime driver in our design process as we worked to ensure that this boat can be just as dynamic as the smaller and marginally lighter TP52’s that it will compete against. The structure of the yacht utilizes state of the art carbon epoxy sandwich construction throughout employing variable core thickness, type and density for an optimized and integrated relationship between shell and internal structure. The structural concept is based around a minimalist internal frame concept allowing for easier sail and gear movement throughout the interior working space. 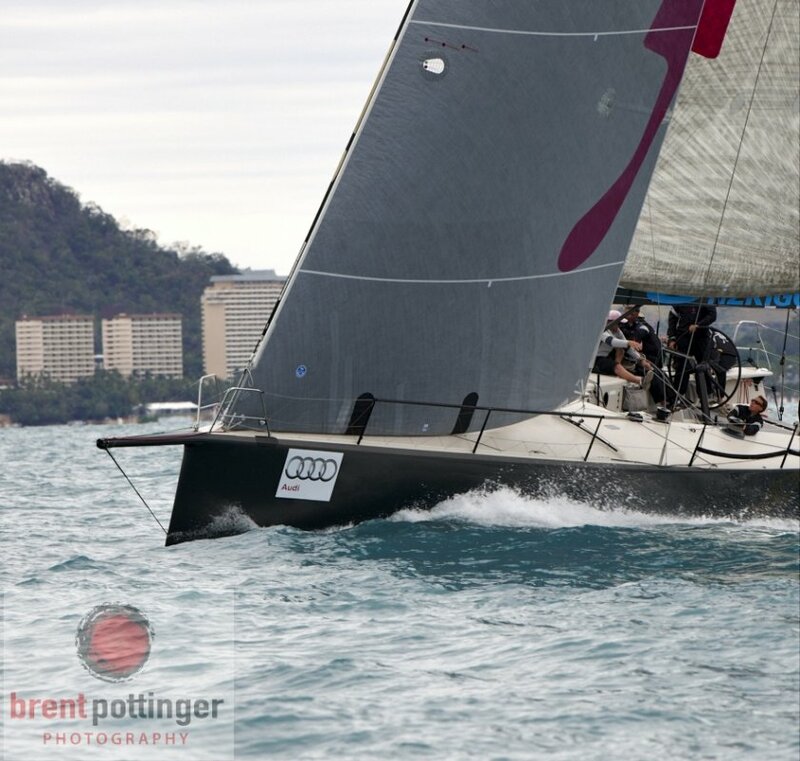 With recognition of the particular demands of offshore racing, the primary slamming areas are cored with a tough foam type with Nomex honeycomb used throughout the remaining hull, deck and internal structural elements. Similarly the shell elements combine a varying weight skin laminate with discreet local pad reinforcement at frames to offer significant margins on panel strength without incurring an appreciable amount of weight. Keel structures are designed not only for robust strength requirements but to achieve a highly efficient and stiff platform to limit keel head rotation that would otherwise translate into additional keel fall off and loss of critical righting moment. Built by Cookson Boats and build managed by Tom Faire. The deck geometry is notable for what it doesn’t have. The geometry consists of a flush deck and moderately aggressive deck camber provide for 6 foot headroom across the main saloon area and all of the forepeak area without any cabin. 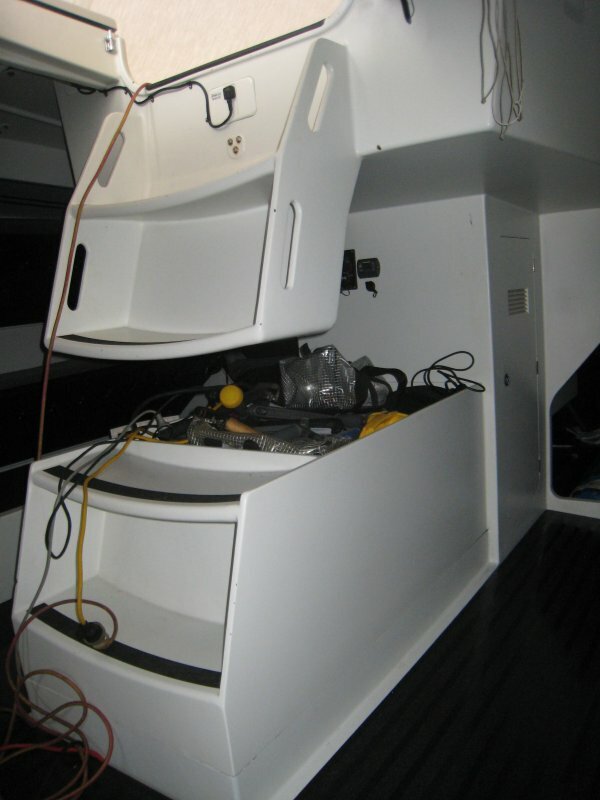 The result of the slightly higher sheer, is a more upright hull topsides while still placing the crew well outboard for stability. The plain deck allows the halyard and other pit functions to be done in simple direct leads. 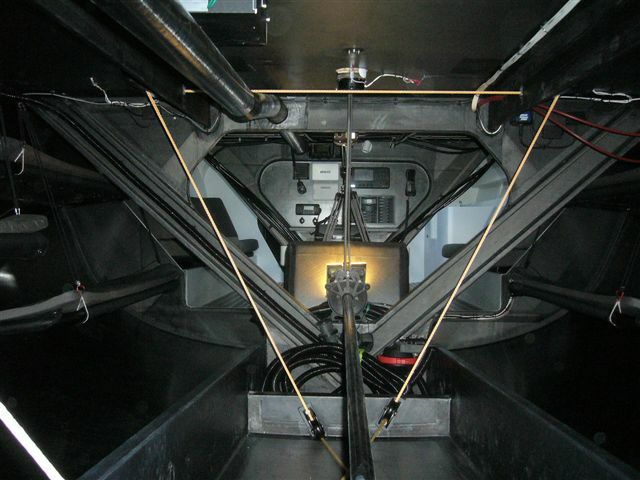 Because the deck is flat between the port and starboard jib sheeting systems we have been able to create a linking of the 2 sides and have combined both of their up/down and in/out functions into 2 total hydraulic cylinders. The cockpit geometry has been designed with a combination of inshore and offshore sailing in mind. 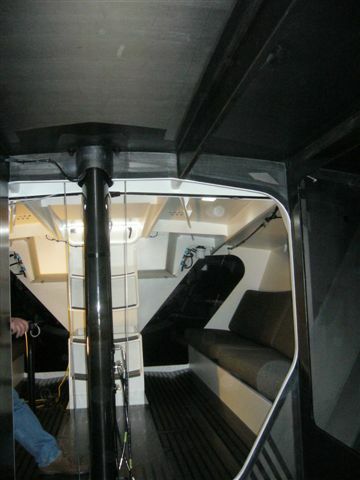 The winch layout has been created to allow for a twin grinder pedestal layout although the first boat launched will be with hydraulically operated winches. Port and starboard mainsheet winches with clutch-able mainsheet allow the leeward mainsheet winch to be utilized as an offshore secondary winch. Port and starboard backstay winches positioned behind the helmsman are combined with fittings on the transom for both single centerline backstay, and twin running topmast backstay systems depending on the mainsail roach/head configuration in use. 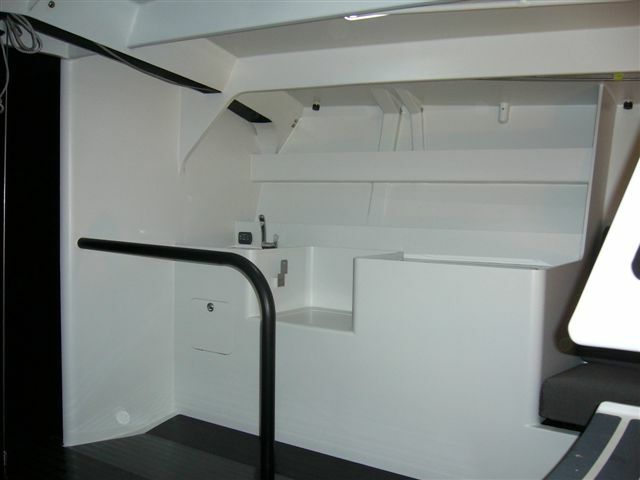 The interior arrangement has been designed for racing functionality with ample berths, head and galley for offshore races. A simplified internal structure reduces weight and provides for an open arrangement optimized for moving sails and gear. 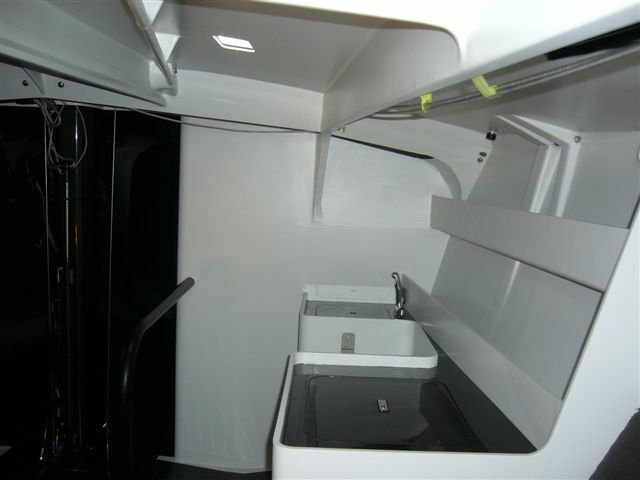 Forward of the companionway is a full galley and head to starboard and an ample gear locker to port. 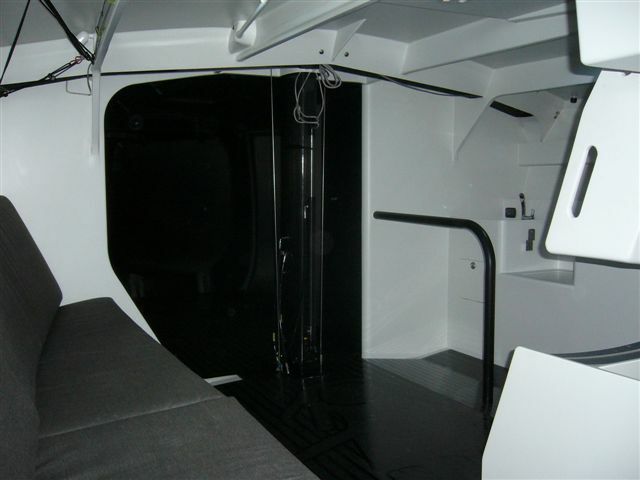 The forepeak structure allows for an owners style forward V berth cabin that should allow for a real dual purpose IRC rating effect. 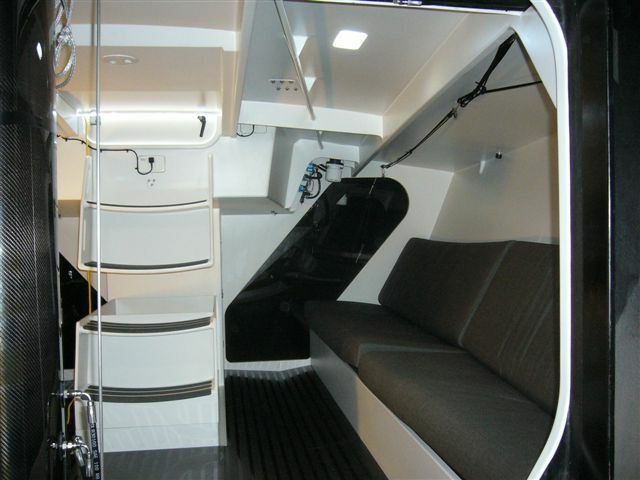 The navigation area, engine, tanks, and batteries have all been positioned centrally for reduced pitching inertia and ease of use in real offshore sailing conditions. The 55hp engine drives a retractable fixed blade prop providing efficient propulsion and reliable backing, reduced weight and zero drag while sailing. 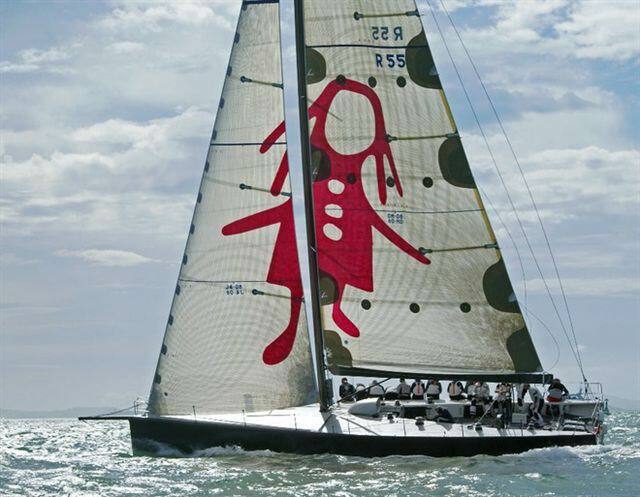 The goal of the sail plan on this design was to achieve a package that would deliver all-around performance in a variety of conditions with choices that help maintain a moderate IRC rating. 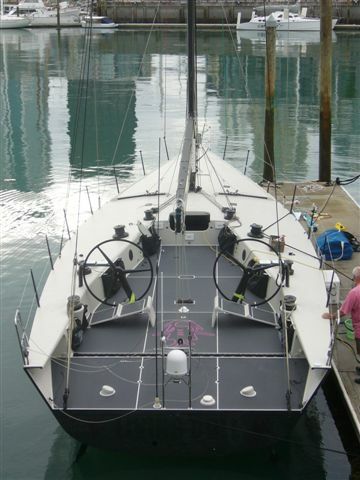 The configuration includes a carbon fiber mast, boom and three swept spreaders with no runners. 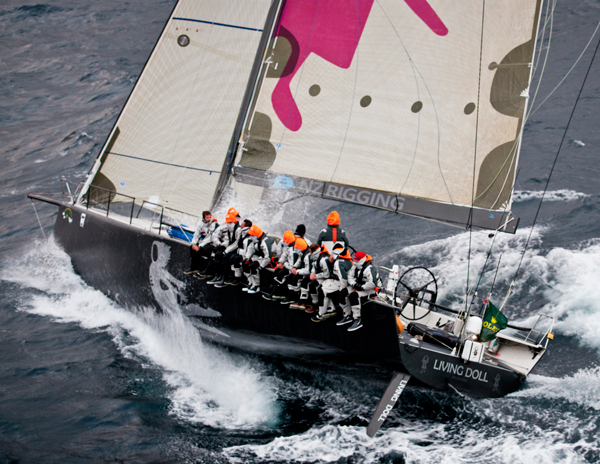 Standing rigging is nitronic rod to avoid handicap penalties and maintain modest costs. The size of the sail plan was developed in conjunction with our sail and rig design partners to ensure that design goals were met, and to increase the integration of these areas with the overall design. The keel package for the IRC 55 features a solid cast iron fin and ‘T-keel’ lead bulb. The maximum draft of 3.5m was chosen for rating benefit and to fit with the overall concept of the boat in terms of displacement and stability. The material choice of cast iron versus fabricated/cast steel for the fin was made for maximum IRC rating benefit and to keep costs down. 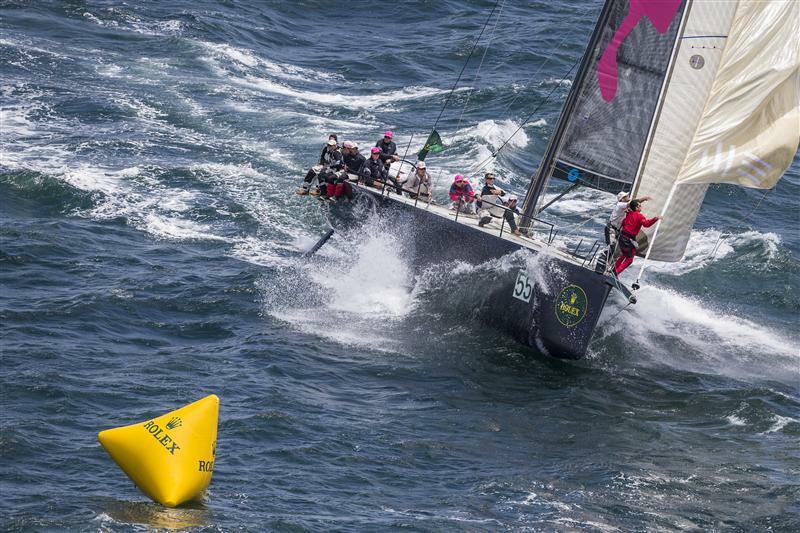 The fin plan-form is trapezoidal and utilizes one of FYD’s proprietary custom foil section designs for optimum performance in round the buoys racing. The top of the fin features a diamond shaped flange giving a wide footprint for attachment to the hull and keel grid. The bulb shape takes advantage of the extensive CFD research FYD has conducted on bulb shape optimization and features a moderate length to diameter ratio and a high squish ratio for optimum performance in a range of conditions. The bulb shape also includes a chine, giving the bulb a low center of gravity and improved lift efficiency upwind and tight reaching. One of the unique features of this design is the twin rudder steering arrangement. 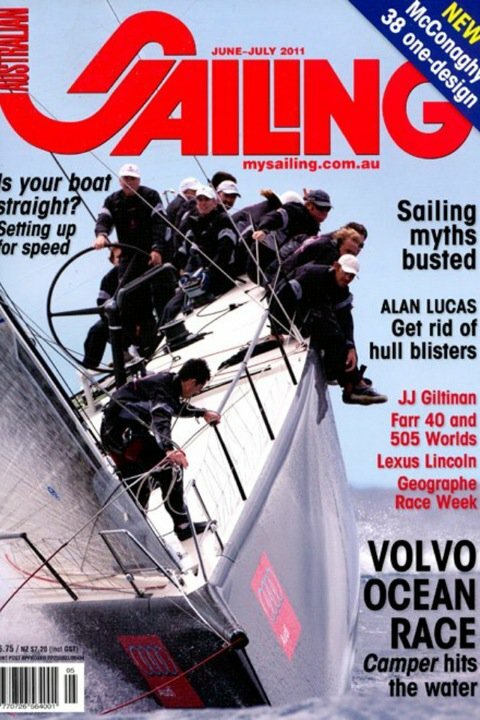 These arrangements are now commonplace on many of the relatively beamy ocean racing yachts like Volvo 70’s and Open 60’s but have only been applied on a limited basis to IRC racing designs. Our extensive experience in rudder arrangements on these other classes of yachts has equipped us with a wealth of valuable knowledge, which we have applied to the design of the IRC 55. The twin rudder arrangement vastly improves handling in critical breezy reaching and upwind conditions. In these conditions the leeward rudder becomes deeply immersed under the hull and hence is extremely efficient at providing the side-force necessary to steer the yacht effectively. This allows the rudders to be of a very small sizing, thereby minimizing the drag in all conditions. The IRC 55 has an all carbon rudder stock, and a female molded carbon/foam blade. 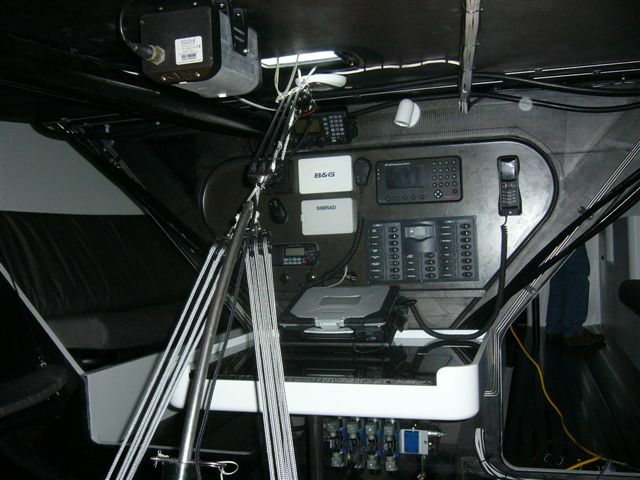 The steering arrangement minimizes mechanical play in the system by minimizing the length of steering cable and using rigid crossbars to link the rudders. The steering system is designed such that the windward wheel steers the leeward rudder providing the most direct feel and feedback between the rudder and the helmsman. The gearing in the steering system is adjustable to provide the helmsman with adequate feel in light airs without overloading the wheel in heavy wind reaching conditions. 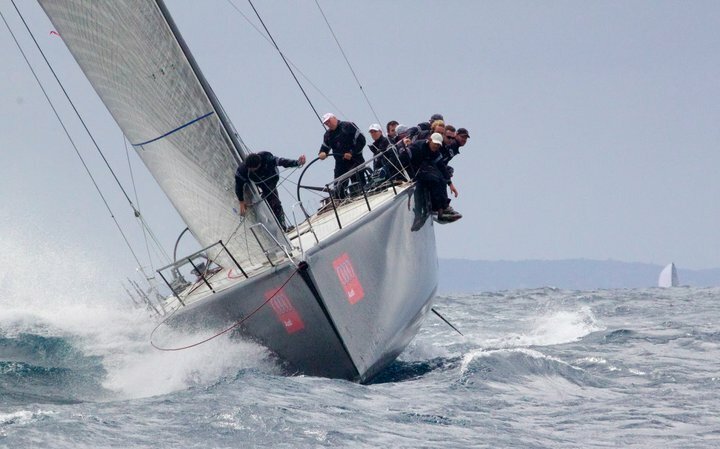 Farr Yacht Design’s, design #642, is a 55 foot IRC racing design with boats currently under construction in New Zealand and Turkey. With a large presence of TP52’s optimized for competing in many IRC fleets, our goal was to design a boat that could race in the same class; faster with a relatively better handicap. 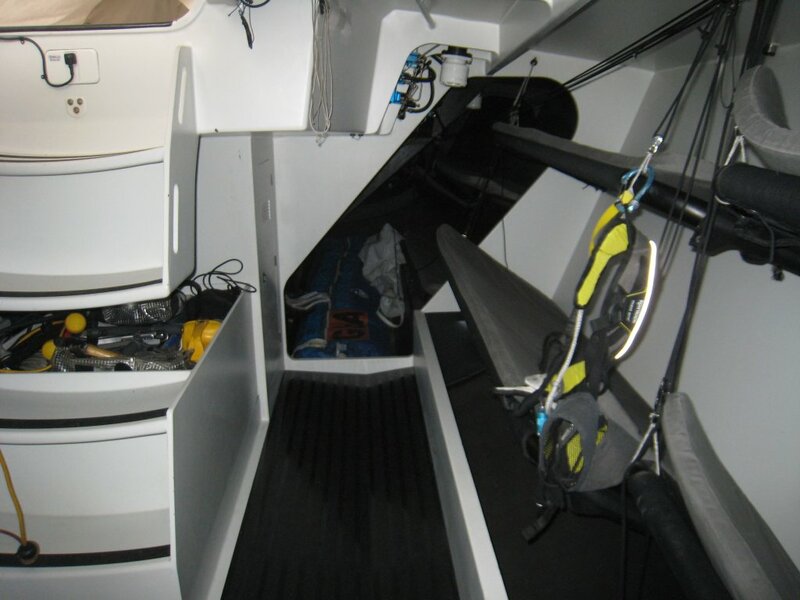 The 55 foot length produces the desired performance leap and moderate increases in displacement, draft and sail area limit the increase in handicap. The hull was developed using the knowledge gained from our recent extensive CFD research on Volvo 70s and GP42s. A unique feature with a large impact on the hull design is the twin rudder steering arrangement. The twin rudders generate much less stern up force allowing the bow to be finer forward for less drag in waves and chop. Because the stern lifts less at high speeds the effective sailing length can be maximized over more of the speed range without incurring handling problems in extreme conditions. Ease of handling in reaching and running conditions was a prime driver in our design process as we worked to ensure that this boat can be just as dynamic as the smaller and marginally lighter TP52’s that it will compete against. 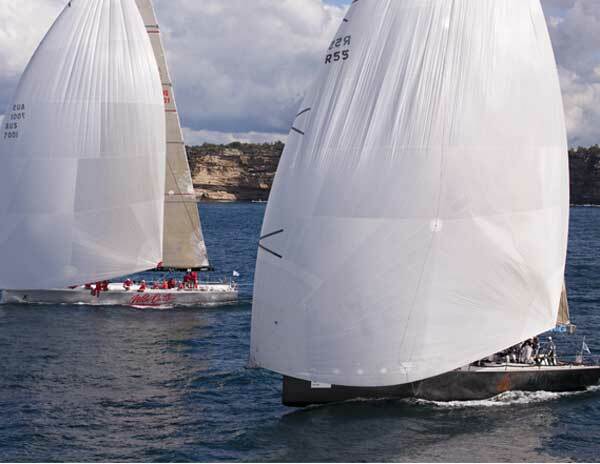 The goal of the sailplan on this design was to achieve a package that would deliver all-around performance in a variety of conditions with choices that help maintain a moderate IRC rating. 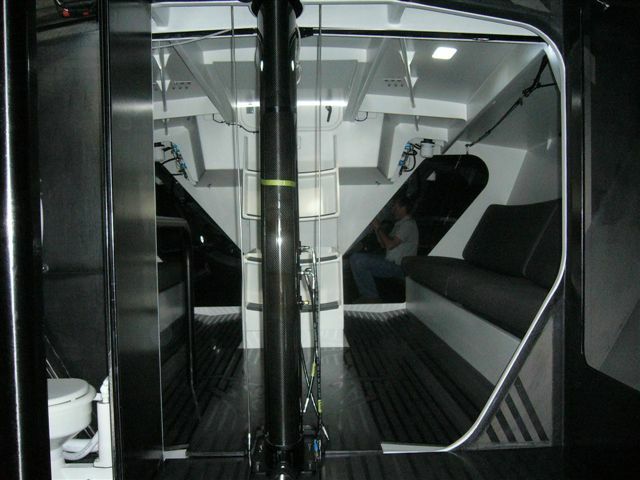 The configuration includes a carbon fiber mast, boom and three swept spreaders with no runners. 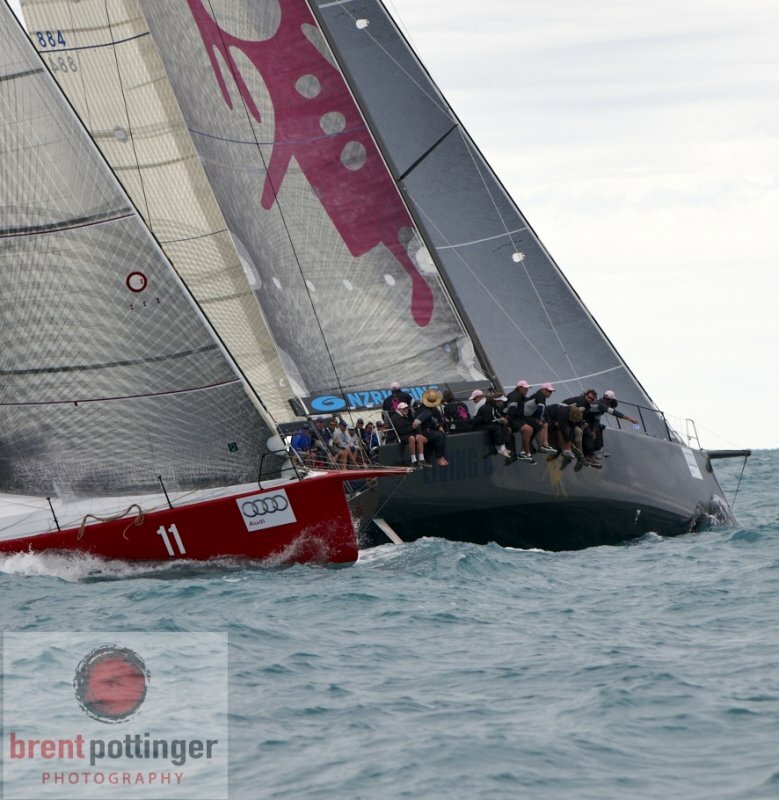 Standing rigging is nitronic rod to avoid handicap penalties and maintain modest costs. The size of the sailplan was developed in conjunction with our sail and rig design partners to ensure that design goals were met, and to increase the integration of these areas with the overall design. The keel package for the IRC 55 features a solid cast iron fin and ‘T-keel’ lead bulb. The maximum draft of 3.5m was chosen for rating benefit and to fit with the overall concept of the boat in terms of displacement and stability. The material choice of cast iron versus fabricated/cast steel for the fin was made for maximum IRC rating benefit and to keep costs down. The fin planform is trapezoidal and utilizes one of FYD’s proprietary custom foil section designs for optimum performance in round the buoys racing. The top of the fin features a diamond shaped flange giving a wide footprint for attachment to the hull and keel grid. The bulb shape takes advantage of the extensive CFD research FYD has conducted on bulb shape optimization and features a moderate length to diameter ratio and a high squish ratio for optimum performance in a range of conditions. The bulb shape also includes a chine, giving the bulb a low center of gravity and improved lift efficiency upwind and tight reaching.